Davis has now made the full version of the local Weatherlink software free to download. This applies to both Windows (v6.0.5) and Mac (v6.0.3) versions of Weatherlink. This good news. 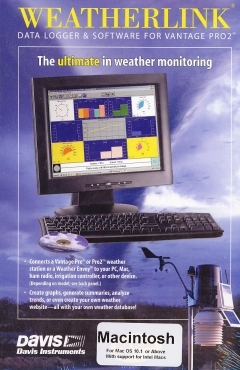 While Weatherlink has always been regarded as free software when included with a logger purchase, the only official way of getting a full new copy of the software (eg if the original CD has been lost) has been to buy a new software CD at some significant cost. There’s also been a steadily increasing problem that modern PCs and Macs often do not possess a CD drive and so there’s been a hurdle to overcome even in first installation of the Weatherlink program. But now all these problems can be overcome with a free download of the software direct to your PC or Mac. We would expect the downloads also to become available from the support section of the main Davis website, but this doesn’t seem to be have been implemented yet at the time of posting.